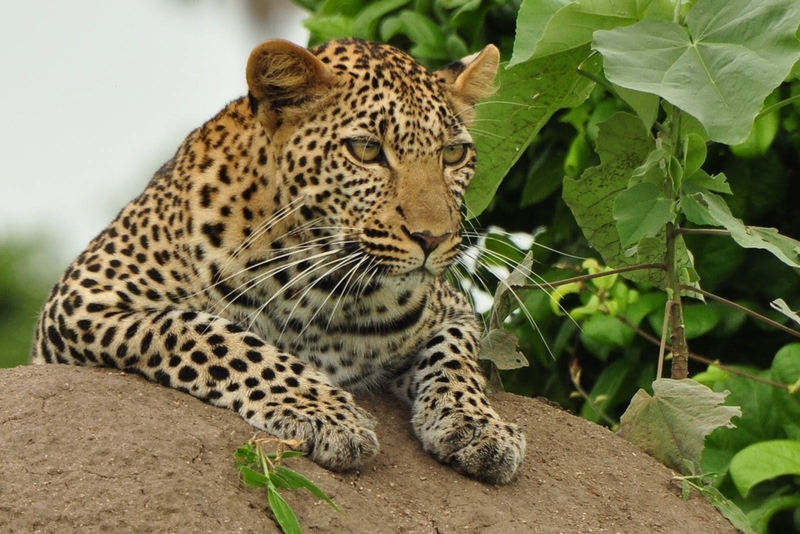 Looking for a Short Camping Safari Tanzania? Look no further. 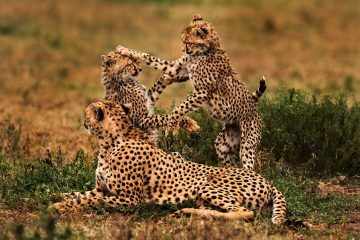 This 4 days Tanzania Camping Safari is the best and most ideal safari you can take if you are travelling on a tight budget. Our 4 Days Camping safari not only saves you money but it gives you a full experience of an adventurous trip in the Northern Tanzania, because you will get to see all the highlights of a Tanzania Safari in the Northern Safari Circuit. 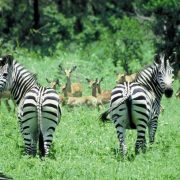 Short Camping Safari Tanzania, where to visit. The short camping safari package is an ideal way for all people seeking a short adventure in Tanzania, because you get to visit both the major wildlife areas namely Serengeti National Park and Ngorongoro Crater but you also get to choose one more park between Tarangire National Park (in most dry months), or visit the Lake Manyara National Park preferably in the wet seasons when Tarangire tends to be water logged. Please ask our safari experts for the best option between the two parks; Tarangire and Lake Manyara, depending on the time of the year. Short Camping Safari Tanzania, Starting point. Our 4 Days Short Camping safari in Tanzania program starts from Arusha and ends back to Arusha where you will be dropped off. However, we can also include your accommodation in a nice budget hotel in Arusha on arrival before or after the safari if you need that. You only need to tell us what else we should include in your program and we shall send the customized itinerary and pricing for the whole short trip to Tanzania. Short Camping Safari, what to bring. 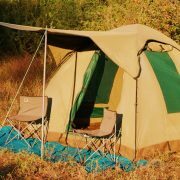 You Do not need to bring any camping gear on this short camping safari in Tanzania, because Tanzania Safari Supremacy provides all camping gear. With an exception of a sleeping bag which you either can bring one from home or get one from us if you don’t mind using ours at a nominal charge. 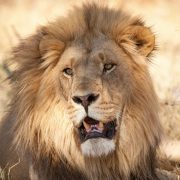 Meals during this safari will be prepared by our well trained and experienced safari cook (safari chef), who also will join you in your entire trip. 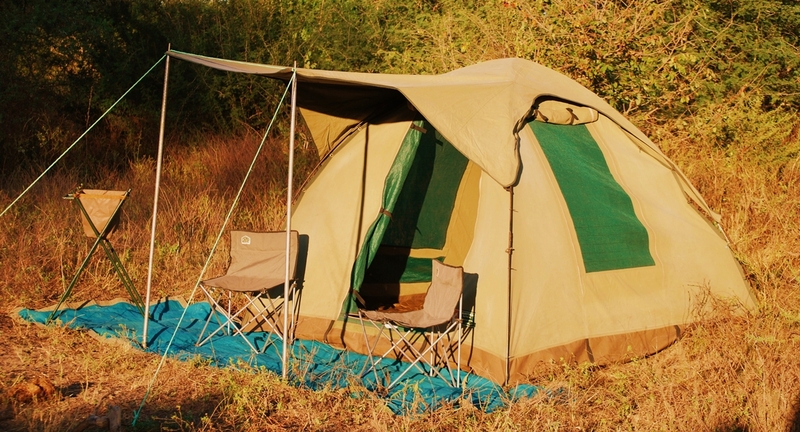 He will be helping also in the pitching of tents to ensure that you spend most of the available time enjoying yourselves and that you make the most of your 4 days short camping safari Tanzania. 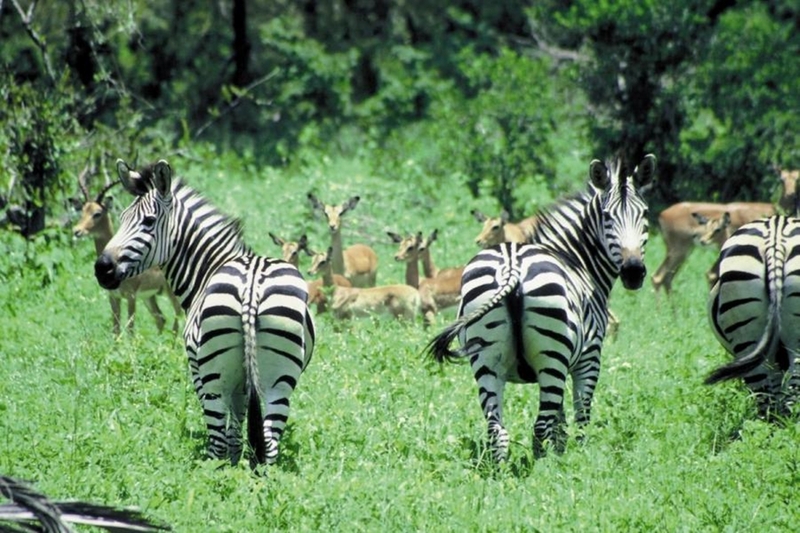 Arusha – Tarangire National Park. This morning of the first day of your 4 days camping safari, you will be picked from your hotel (pick up point), in Arusha and after a short stop at the supermarket to buy any provisions and personal effects, you will depart on a 4×4 safari land cruiser for Tarangire National Park famous for its large herds of elephants and huge baobab trees. Crossing the Masai Steppe you will enjoy the beautiful landscape and sights of Maasai villages along the highway. After a short 2 hours drive you will be at the Park’s Gate where you will make a brief stop for paper work. 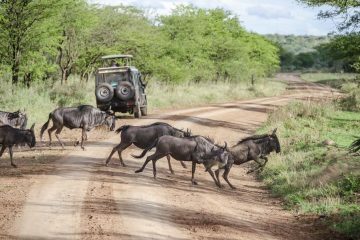 After registration at the Park’s Gate you will embark on your first game drives straightaway in search of the many animals that Tarangire has to offer. The Tarangire River a permanent river in this park is the lifeline that ensures abundance of wildlife , including zebras, giraffes, buffaloes, impalas, gerenuks, olive baboons, water bucks and the big cats including the lions, leopards and cheetahs. Tarangire is also a birdwatchers haven with more than 55o bird species recorded, including the rare species like the Ashy starlings. With Lunch at one of the picnic sites the afternoon will be spent doing game drives and later in the afternoon you will drive out for overnight at a public campsite around the park, or drive to Mto wa Mbu area (near Lake Manyara) for camping at a campsite like Lilac Campsite. Packed Lunch and Dinner included. Instead of Tarangire National Park, you may do the Lake Manyara National Park depending on your preference and season. Tarangire National Park to Serengeti National Park. From the Tarangire National Park you will drive to the Serengeti National Park after a nice breakfast at your campsite, prepared by your professional experienced safari cook. You will cross the Ngorongoro Conservation Area on your way to Serengeti and you will have an option to visit a Masai boma (village), within the Ngorongoro Crater if you wish (at extra cost). By midday you will be at Naabi Hill Gate where you will have your picnic lunch and a walk around to stretch your legs if you wish, then after registration you will enter the Serengeti and proceed on your first game drive in the Serengeti National Park. Depending on the time of the year you may be lucky to see the wildebeests migration herds but apart from the migration, you expect to see a lot more resident animals. 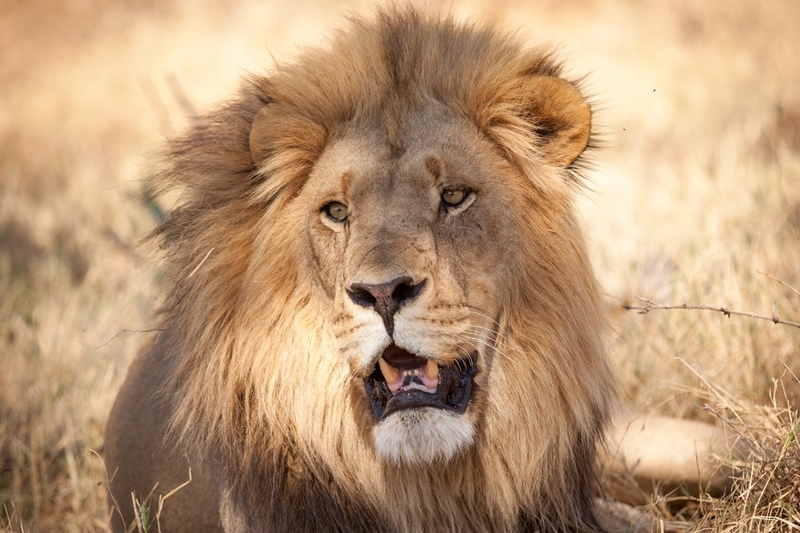 Among the animals that you may see in the Serengeti includes prides of lions, leopards, cheetahs, topis, hartebeests, zebras, elephants, gazelles, impalas, warthogs, and many more animals and birds. Later at sunset you will check in at a campsite where you will pitch camp for dinner and the overnight stay. Overnight at a public campsite at Seronera. All meals included. Serengeti National Park to Ngorongoro Conservation Area. You may go for an early morning game drive at sunrise (if you wish), then after a hearty breakfast prepared by your able chef, you will pack your stuff and go on a game drive in the Serengeti National Park. You will be driving towards the Naabi Hill Gate and will have a packed lunch which you will take most likely at the Gate, before you drive up to the Crater rim of the Ngorongoro Crater. Arriving in the later in the afternoon at your campsite you will relax as your chef and guide pitch your tents. Dinner and overnight at the Simba Campsite overlooking the Ngorongoro Crater floor. All meals included. This morning you will descend very early morning into the Crater floor to allow enough time to do game drives at the floor of the Ngorongoro Crater which is one of the UNESCO world heritage sites. The Ngorongoro Crater also referred to as the 8th wonder of the world or the Eden of Africa is a unique wildlife area owing to its 600 meter walls that make a natural (zoo like) enclosure to thousands of animals with highest concentration of animals in a single area in the world. The Crater walls act like a barrier denying thousands of animals the chance to escape, more notably the Big five including the Lions, Elephants, Buffaloes, Leopards and the Black Rhino which thrive in this area. Other animals that can be spotted easily and at close range in the Ngorongoro Crater include the zebras, silver back jackals, hyenas, impalas, topis, hartebeests, gazelles, and many other more. The Lake Makat in the center of the Crater floor is a home for flamingos and other aquatic birds like the Egyptian geese, and others. Lunch will be taken at the hippo pool side or at any of the campsites at the Crater floor then you will ascend up and rive out of the Conservation area before the lapse of your permits time. 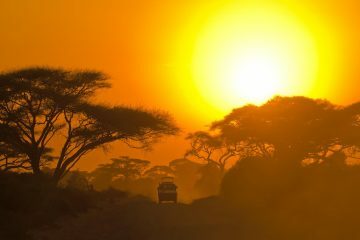 You will then drive back to Arusha town where your safari ends arriving in Arusha in the late afternoon / early evening. We can always arrange your accommodation at Arusha if you are still around, or at a small supplement we can offer you a transfer to the Kilimanjaro International Airport, if you are departing on this evening. End of your 4 Days short Camping Safari Tanzania!. Children Prices depend on Age of the child and room configuration. We can customize the program according to your interests and budget.